Mostly clear. Slight chance of a rain shower. Low 49F. Winds SSW at 5 to 10 mph..
Mostly clear. Slight chance of a rain shower. Low 49F. Winds SSW at 5 to 10 mph. With a new ROPS installed, this 1968 International 656 is ready for its first season at Grow: Johnson County, an Iowa project that produces fresh produce for 15 hunger-relief agencies on just 4 acres of public land. Operating a farm safely is a big job, no matter the number of acres. If you happen to run a farm that uses mostly volunteer labor and is located on public land, safety considerations become even more critical. Grow: Johnson County is a project of the Iowa Valley RC&D that produces more than 40,000 pounds of fresh produce every year for 15 hunger-relief agencies on just 4 acres of public land. Located at the Johnson County Historic Poor Farm, the organization’s three full-time staff members oversee volunteer and seasonal workers from spring to fall, producing fresh food for people who need it. Last fall, the RC&D purchased a 1968 International 656 for the farm. The tractor will be used for all aspects of the operation — primary tillage, mowing, transplanting and hauling. With a 65-horsepower engine, the tractor has enough lifting capacity for the water wheel planter and a hydrostatic transmission that allows it to smoothly drive at a very low “creeper speed” for transplanting. Plus, its 40-inch wheel base and 15-inch tires fit their row spacing and bed size, and the loader can efficiently move pallets of produce after harvest. The problem? 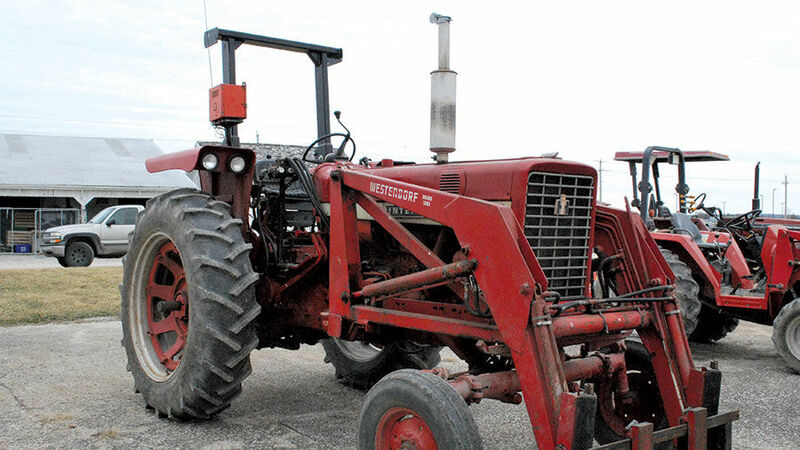 The tractor was manufactured well before 1986, the year that Roll-Over Protective Structures (ROPS) were mandated for all tractors over 20 horsepower, and it lacked this critical safety feature. Jake Kundert, food system director at the RC&D, sees the Grow project not only as supporting the local emergency food supply, but as a public demonstration farm. Ensuring that the farm is always adopting best safety practices for staff and volunteers is important. The RC&D received a grant from the Johnson County Emergency Flex Funding program to purchase a ROPS. But finding and installing a ROPS and seatbelt for an older tractor is not as easy as stopping by your local dealer and picking one up. Kundert, along with Jason Grimm, who farms in North English and is deputy director of the RC&D, first checked with dealers, but none were able to help. Next, they called the National ROPS Rebate Program, based in New York, which provides rebates of up to about 70% of the cost of most rollover protection systems. There is no funding available for Iowa farmers in the program, but the staff put Kundert and Grimm in touch with a Canadian company, Laurin, that could manufacture a foldable ROPS specifically for their tractor. Kundert called Laurin and “after that first awkward call where they answer in French” the staff quickly identified a ROPS package that would work. The Iowans first had to determine whether their tractor had a “round” or “square” axle, eventually emailing a photo to Laurin to ensure they were correct. “Even though the axle looked square to us, the fenders were attached with a round U-bolt that sits in a groove in the axle. That makes it a ‘round’ axle,” Kundert said. In March, the tractor was hauled to Grimm’s family farm, where his dad, who has 30 years of experience in tractor and aviation mechanics, helped them install the ROPS in about two hours. The job requires a trusted mechanic and the right equipment. “Figuring out that we had to take the fenders off and then figuring out how everything needed to be spaced from each other” took the longest, Grimm said. They first thought the ROPS would sit beside the fenders; they eventually realized that the fenders would sit on top of the ROPS bracket, and the bolts that hold the ROPS also thread through the fender mounts. The installation also required them to think about how hydraulic hoses should be routed as well as where to relocate an aftermarket toolbox and, most importantly, a radio. The toolbox didn’t make the cut and was removed. The radio was mounted on a post that bolted to the fender, so that the ROPS wasn’t drilled or compromised in any way. Grimm noted that you need adequate shop space, as well as an A-frame to hoist the ROPS and mount it. He also used an impact wrench to tighten the bolts for the brackets. “You could do that by hand, but it would take a lot longer,” he said. He advises that any repairs to hydraulic systems or brakes be completed before the ROPS installation. The 656 was due for brake maintenance, which required that they open the brake cases on each side of the tractor. “I wish we had done that before we put on the ROPS,” he said, because it was hard to access the cases. Finally, take stock of your tractor’s seat before installation. A ROPS has two critical parts: the roll bar and the seat belt. Without a seatbelt, a ROPS is ineffective. Grimm said the seatbelt installation was easy because the tractor’s seat was in good condition and had an obvious place on the seat frame to bolt the seatbelt. “Sometimes it’s hard to make an argument for investing in a ROPS if you’re cash strapped, so you should think about how to build it into the initial cost of purchasing your tractor,” Kundert said. The ROPS for their tractor cost $2,600 with shipping and tax. “As a working farm on public land, it’s important that we set a good example and make sure all workers and visitors are safe,” Kundert said. Brandi Janssen, PhD, directs Iowa’s Center for Agricultural Safety and Health at the University of Iowa.